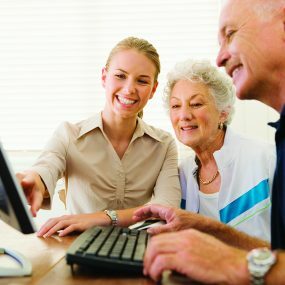 For businesses, schools, libraries, community centers, clubs, or other groups seeking to have your members expand their computer skills and knowledge. From teaching the basics to the more advanced technologies, our customized training will provide a strong foundation. Learn about Word, Excel, PowerPoint, Access from Microsoft Office 365 suite on PC or Mac. Keep your book-keeping staff current by learning how to properly invoice and create reports in Quickbooks. Manage your website with lessons in coding or Content Management Systems like WordPress, Durpal or Joomula. Enhance your digital photos with Adobe Photoshop or Photos app on a Mac. Piece together your movies with Adobe Premier Pro 6 or iMovie on a Mac. These sessions will provide your employees or group members with the computer skills that employers need. All classes are for On-site Training for as many employees or members you want us to train. We provide you with 12 PC or Mac computers, all you need to do is provide us with space. Whether it’s a one-time session or a multitude of sessions there is no need for you to invest in computer resources or send your employees out of the office, but if you do want to send your employees or members to our offices we can accommodate a conference room. If privacy isn’t important you can always register your employees or group individually at our public sessions throughout Long Island, NY. For a list of course offerings, check out our Events calendar.